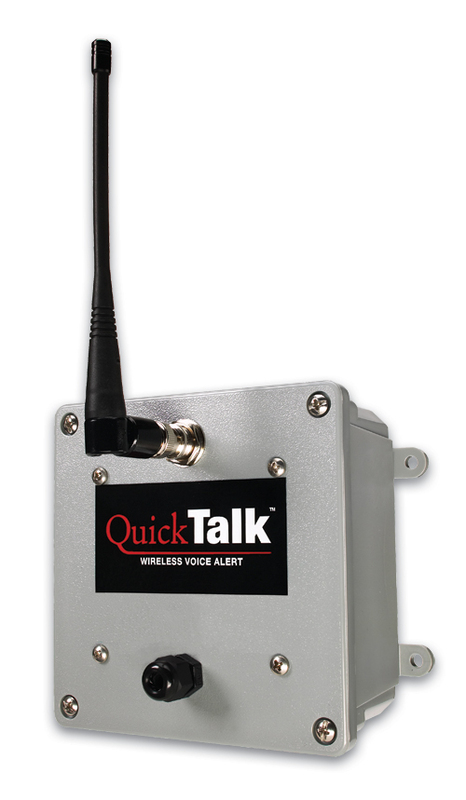 QuickTalk Wireless Monitor and Alert System by Ritron. This product allows remote 24/7 wireless monitoring of an existing switch or sensor, or one of the Ritron compatible accessory switches. 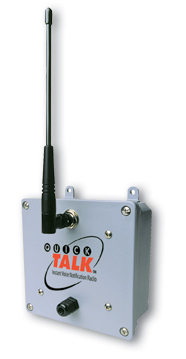 When the switch is pressed or a pre-programmed change is detected at the monitor, the QuickTalk unit sends out a pre-recorded message to all two way radio equipped personnel in the area. It's like being in two places at the same time. The QuickTalk allows staff to focus their attention on immediate priories while the QuickTalk monitors for a change in conditions. 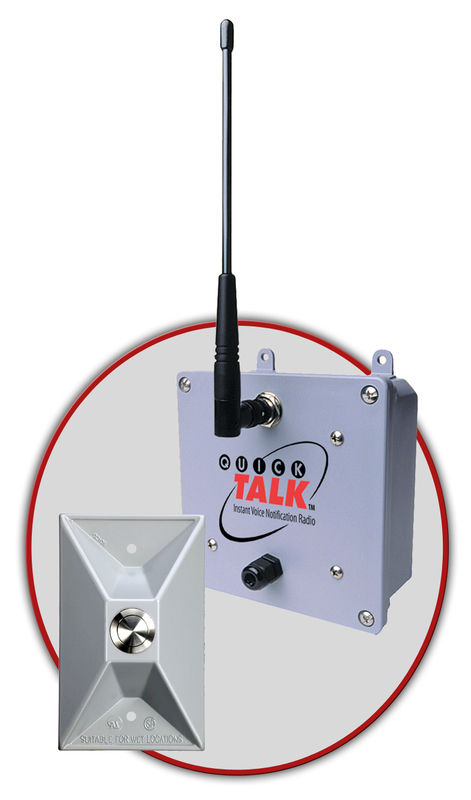 Connect any switch or sensor to the QuickTalk. When a change is detected, your custom recorded voice message is automatically transmitted to all your two way radio equipped staff or personnel within range. This can help to prevent a minor incident from becoming a major headache. 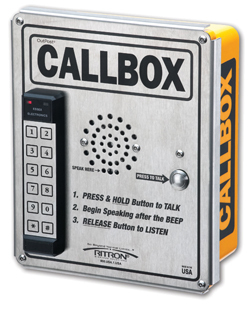 Call Button/ Panic Alarm - A stainless steel push button assembly (sold separately in this section) connected to the QuickTalk provides an effective push button alerting solution. With a simple push of a button, a custom pre-recorded alert message is transmitted directly and discreetly to radio equipped personnel. Door Alarm - A magnetic door switch (sold separately - contact for a list of manufacturers of compatible switches) connected to a QuickTalk transmitter allows easy monitoring of open doors, windows, tool cribs, etc. It can also be programmed to monitor and alert when a "propped" door condition is detected. 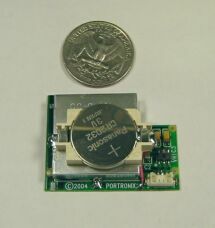 Power ON/ Fail Alarm - With the Power-Out Alert (contact for a list of manufacturer of this type of switch) connected to a QuickTalk, it can detect a loss of AC power and immediately trigger the QuickTalk to send an alert to all radio equipped personnel. It also works through repeaters. Temperature Alert - This device (sold separately - contact for a list of manufacturers) connected to a QuickTalk lets you monitor and receive voice alerts for pre-set high or low temperatures. Use for monitoring the environments of livestock, produce, refrigerated units, and computer rooms. Liquid Level Alert - Monitor liquid levels. A simple marine grade liquid level switch (sold separately - contact us for a list of manufacturers) connected to a QuickTalk can help provide an early warning alert for both high and low level conditions. Your Application - The appropriate switch ( up to 2), connected to a QuickTalk radio gives you the advantage of 24/7/365 wireless monitoring and instant alerting. Monitor anything, anytime, anywhere - remotely. Choose from standard and high power models, and UHF and VHF models, below.